Eels are not only returning with a new album, but they will also be launching a world tour on Valentine’s Day… more about Eels new. 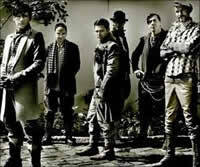 Rammstein have set a January 15, 2013 DVD and Blu-ray release date for Videos 1995-2012. We were sent over these details: The collection includes the band’s complete music video catalog along with two new videos for the song “Mein Herz Brennt.”… more about Rammstein new.